It's easy to spot a winner when it's this sparkly. 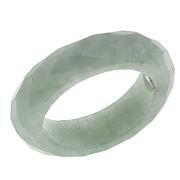 Paint the town or simply indulge yourself with a dose of pretty jade and gemstones. 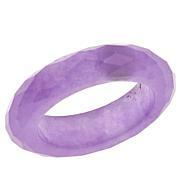 This ring's striking shine and spectacular design will let you, the fashionista, be recognized from a mile away. This is a pretty ring. The jade is quite large. I also purchased the purple one, and Im very happy with both. This is a beautiful ring! The jade is stunning and bigger than what I expected. Its such a pretty color. The amethysts on the sides are just as pretty. I love the ring but don't like the gory look of the CZ's. 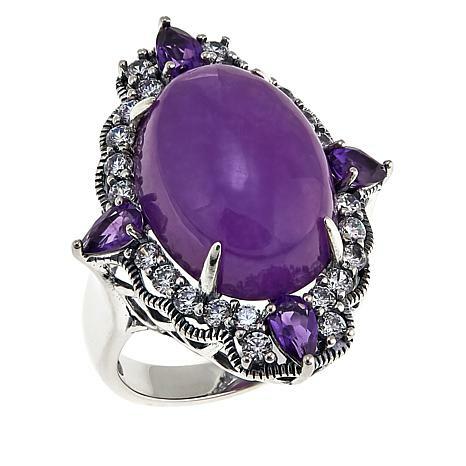 The amethyst is quite lovely and really accentuates the purple stone. I wish the cz's were of a different quality for the clear stones takes from the beauty and gives a low end costume jewelry look. It is a fun piece, and I'll keep it but will wear it casual and not dressed up. In my opinion it does not wear well with fine jewelry so I won't mix. So glad I got it on sale. 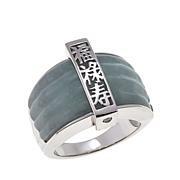 Very pretty piece of Jade, like the cut. Everything is sparkly and well made but it is uncomfortable to wear - the 2 side pieces of red Rhodolite cut into the adjacent fingers. Prongs are sharp and when the ring slides on my finger it hurts. Also, the size runs large, you might want to consider going down a size. Very nice ring that I will not return in spite of issues because it is so pretty.